Hi there! 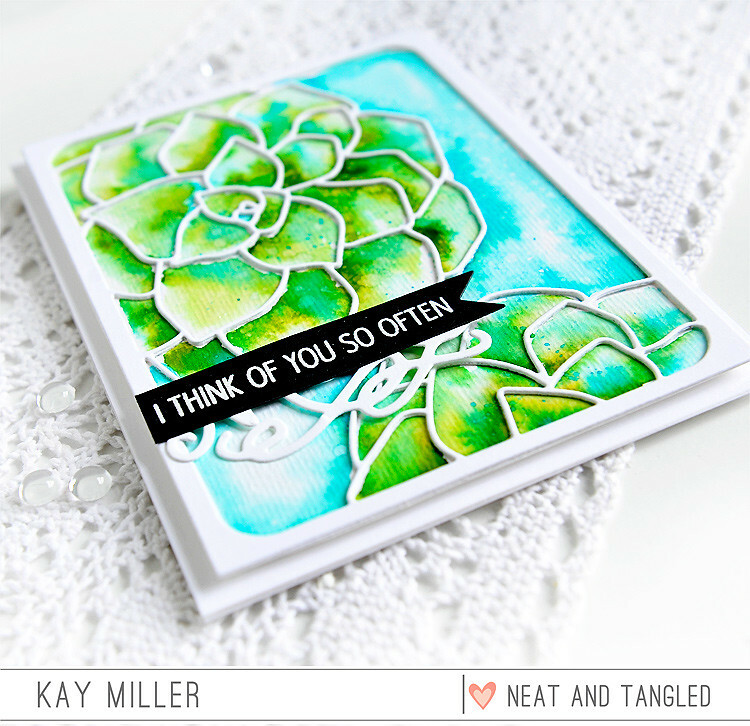 Welcome to the final day of the May Neat & Tangled release countdown! All of the new products are available in the Neat & Tangled Store NOW! Today I'm using the new Succulent Cover Plate. This is a really cool die, and there were a lot of different ideas I had for ways to use it. I still want to try some different things, but for my card today I decided to do a little more watercoloring. So first, I impressed the die into some watercolor paper using an embossing mat through my Big Shot instead of the cutting pads. After I had a nice impression, I used my Zig Clean Color brush markers to color in all the petals and background. 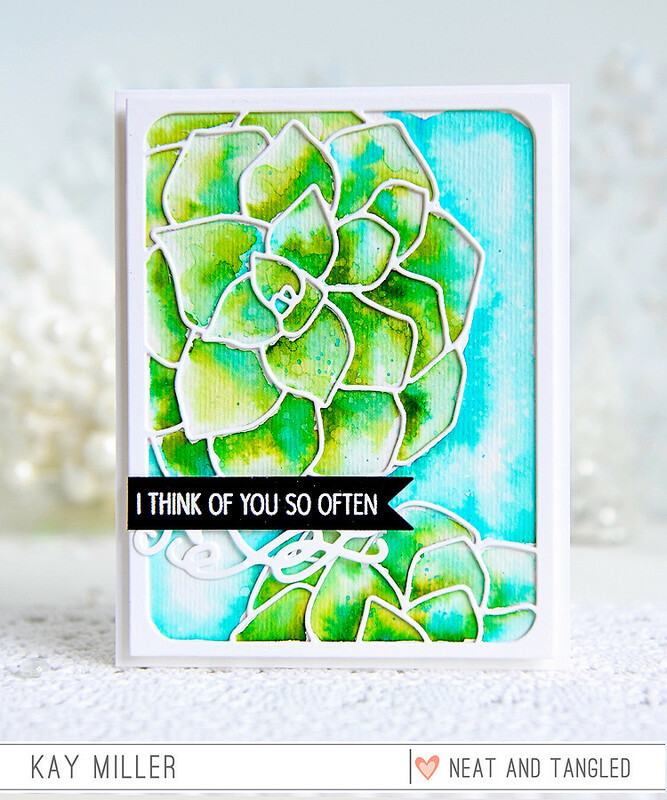 After I finished my watercoloring, I cut out two of the Succulent Cover plate dies out of just plain white card stock. I glued these both over my watercolored piece. All of the new products that we have been showcasing this week are now available in the Neat & Tangled Store! This is terrific, Kay! I really like the idea of impressing the image first and then watercoloring. That sounds like a very good way to contain the watercoloring. The colors you chose look wonderful. You got some really pretty blends. Seeing your watercolors makes me want to sit down and watercolor all day! :) Thanks so much for sharing! :) Happy Friday! Hugs! Love the depth of layered up cuts! Gorgeous watercoloring Kay! Such a pretty card! So wonderful. I know it is a succulent but it reminds me of a hydrangea with the shading you have produced with the Zig markers. This hop has been so enjoyable thanks so much for your lovely creations. Love this, Kay! 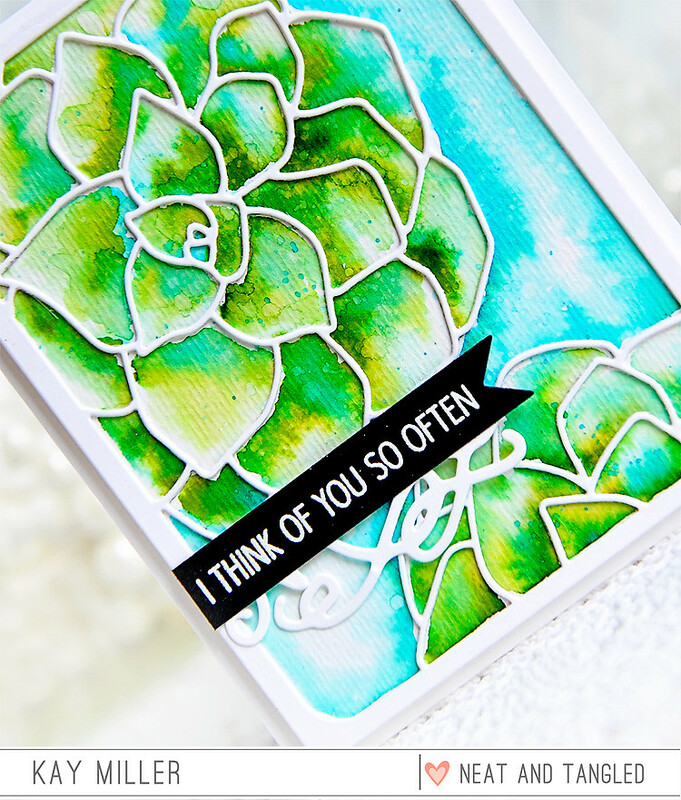 The White against the watercolor is a real eye pleaser! LOVE this, and you enabled me to buy it after seeing this beauty! Thank you for explaining how you designed it--hope to try your fab technique! Beautifully done Kay! I like the dimension and the cool watery colors! Such a pretty card Kay! I can't imagine a prettier card with this die, Kay! Thanks for sharing how you embossed with the die first. It's so stunning!